Proper shading techniques require smooth blending, but sometimes it takes a little while to master them. My students often ask me why their shading does not come out the way they want it, even though they think they know what they are doing. The trick lies in very steady wrist movement and exerting an even pressure with your wrist on your drawing pencils or charcoals. It takes some practice but everybody can master shading techniques. You need to apply your pencil lines softly and always in the same direction. Before a blending tool such as a tortillon is used, the lines are sloppy and look like scribbling. First band is a result of hazardous shading. The middle band is careful hatching with steady and even pressure ; the bottom band is smoothed out with soft cloth. It takes a longer time to apply the lines closely and in a consistent direction. You fill in the spaces as you go. I added tone to build a deep black, then softened my touch and gradually got lighter as I moved to the right. If necessary, blend the tones with a tortillon (these are spiral-wound cones of paper). 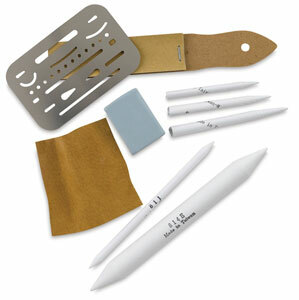 They come in different sizes and are great for blending pencils. Hold them at an angle, not at the tip. Use the same up and down motion you used with the pencil. I have to go very light on my wrist when drawing, whereas when painting I am more ruthless. If I don't ease up, I tend to overdo it and end up leaving heavy distracting markings. The exception is, of course, when you do expressive drawing using strong and sharp lines. The discipline you gain from keeping your blending smooth goes a long way. It will help you with your more expressive drawing as well. Shading done with your fingers will look timid and weak if you are not experienced. I know it is only too natural to move your fingers while keeping your wrist immobile, but you'll get better results in the long run, if you work from your wrist. The only exception is when you are shading a tiny isolated area. As an exercise, try holding a pencil and using your wrist to move it around. Then switch to holding your wrist still and move the pencil with your fingers. Can you tell the difference? 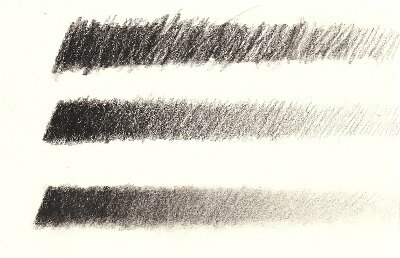 One useful exercise you can do at home is to create a single shaded band that ranges from the darkest to the lightest tones you can create--creating a gray scale, in effect(see the first graph above). The longer the band, the more tones you will have to create, and the more challenging it is. You should strive for seamless transitions from one tone to another. This exercise not only flexes your drawing muscles, but also trains your eyes to be sensitive to tones. You should make sure you have enough hatching before you use any blending tools. Use a very light touch to start with. It is better to go light in the beginning than to start too hard. Some pencils will leave such strong marks that even your blending tools can't make them go away. Use blending tools like tortillions, a chromois (a piece of extremely soft cloth—it is my favorite) or a soft brush to further soften the tones and lines. Another good tool is a kneaded rubber eraser which I use a lot for both pencil and charcoal drawings. You can shape it with your fingers, so it can be adjusted to meet a variety of needs. Shape it into a point to remove pigments and show the lighter shades underneath. Learning to blending beautifully DOES take time and practice. Once you become comfortable with hatching (with the lines all running in a single direction), you can try out crosshatching. But wait until you're ready; crosshatching can be a disaster when you use it incorrectly. Be patient and stick to the basics until you are completely comfortable with them. Find out more about advanced drawing lessons.